"Smart Valve Stem Caps" from Valley keep continual eye on center-pivot tire condition. Valley Irrigation is introducing a new tire pressure monitoring system for center pivot machines that will communicated through the Base Station 2 and Pro 2 control panels to alert irrigators of problems with tower tires. The TPMS is the first in the irrigation industry. 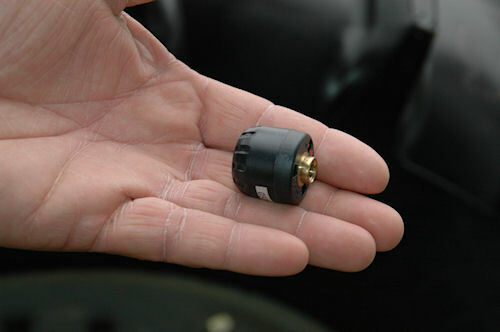 Through screw-on "smart valve stem caps" the system measures tire pressure continually and sends an "OK" signal as long as pressures are within operating parameters. Once pressure falls below that level, an alert is sent to the pivot's control panel. And, if pressure falls to zero, the system can be programmed to shut down the machine until repairs are made. 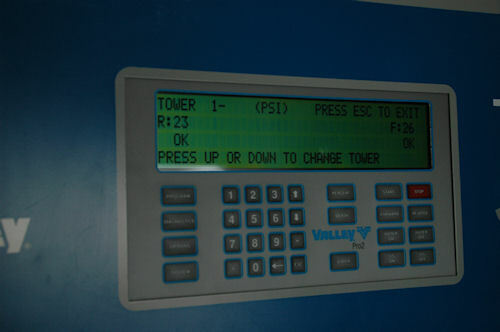 Valley's Pro 2 control panel "data" page allows irrigators to check tire pressure on individual wheels on rigs up to 16 towers. The innovation allows quick tire replacement or repair when problems arise, and doesn't require the tire be broken down to install the monitor. Each cap is specifically "known" by the system so the operator can determine at a glance which tire on which tower is in need of service. For more information on the TPMS and its applications, visit www.valleyirrigation.com. This sophisticated valve stem cap is individually coded to Valley's Tire Pressure Monitoring System, set for release next February. The caps continually measure pressure in center-pivot tower wheel tires and related circuitry can alert growers of low pressure, and can shut down the system if a tire is flat.